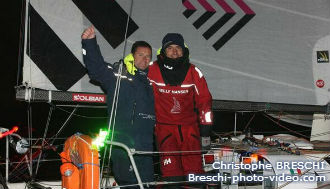 Giancarlo Pedote and Sébastien Josse have won the first regatta of the year aboard Prysmian ITA 747. Giancarlo Pedote, aboard ITA 747 Prysmian together with Sébastien Josse, skipper of Edmond de Rothschild Multi 70 and who already raced with him in 2013, won the first edition of the Lorient Bretagne Sud Mini 2014, the new regatta organised by Lorient Grand Large, which has kicked off the Atlantic racing season for the Mini 6.50 class. This was Giancarlo’s first regatta of the year and his first race with Sébastien this season: "I am very pleased to be starting the new Mini 6.50 season and to be sailing with Sébastien," said Giancarlo. "Last year we raced the Demi Clé together, on a course very similar to this one. After the race we promised that we’d come back, and here we are. The boat is back in perfect form, with a new bowsprit and improvements thanks to the AMCO shipyard. During training last Tuesday, it reached 15 knots, which onboard a small 6.50-metre fireball was a great feeling." The Lorient Bretagne Sud Mini 2014 was organised over a 115-mile course, starting from Lorient, taking participants around the islands of Belle-Ile and Groix from the south and then back towards Pornichet. It was a technical course (the Teignouse strait, circumnavigation of the Islands and the Plateau du Four), featuring two long stretches of navigation (approaching and departing from Groix). The 2014 season marks a renewed alliance between Prysmian Group and Giancarlo Pedote. Prysmian ITA 747 is one of the most technologically advanced prototypes ever launched, with a canting keel, 4 telescopic ballast chambers and a rotating shaft and rocker arm. 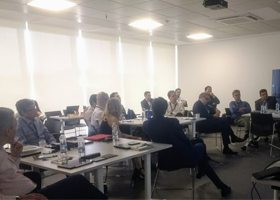 Prysmian Group’s involvement and support for Giancarlo's projects reflects its corporate mission to pursue excellence in performance, quality, competitiveness and innovation, while always aiming to respect the environment and use resources in a responsible manner. Like in sailing.